The latest presentation in the display cabinets in Alresford Library in Broad Street shows some photos and artefacts from the Alresford Bowling Club. The sport of bowling has been active in Alresford since around 1650, around 350 years ago, and it is possibly the second oldest recorded bowling club in the country. The current bowling green on Sun Lane is known to have been in use from 1823. Records suggest that in earlier times the bowling green was on the East of Sun Lane, the opposite side of the road – it was probably relocated to the current site when Langstone House was built in the nineteenth Century. The current club was re-formed/established in 1937, through the efforts of Sidney Lane: he had moved to Alresford during the First World War, with the firm of solicitors run by George Ridley Shield. After WW1 he returned to London, but moved back to Alresford on his retirement in 1937. The first members of the re-established club included such people as Canon A J Robertson, Lord Templemore, Sir Anthony Tichborne, Sir Francis Lindley, Doctors Leishman and Meryon, and George Ridley Shield. Cameron Black, the Publican at the Sun Inn, agreed to rent the green to the new bowling club for £10 per annum. The 1938 members of the bowling club were shown in the photo below, courtesy of www.alresfordheritage.co.uk, which numbered from the right include: 1. Edgar Blake of the World’s Stores, 2. Canon Robertson, 3. Sidney (Lofty) Lane, 4. George Wigmore (Barber), 5. Claude Hunt (Tobacconist), 7. H C Godwin of Langton’s Farm, 10. Bert Davy, and 14. Mr Bascombe (Postmaster). Currently the Alresford Bowling Club has over 70 members, plus 10 non-playing ‘Social’ members. For information and membership details, please contact Barry Morgan, Secretary, Phone 733477 or visit the website, www.alresfordbowlingclub.org.uk. The display of Alresford Bowling Club items can be viewed in the library during opening hours. These include Saturday morning and all day Friday, as well as half days on Monday, Tuesday and Thursday. 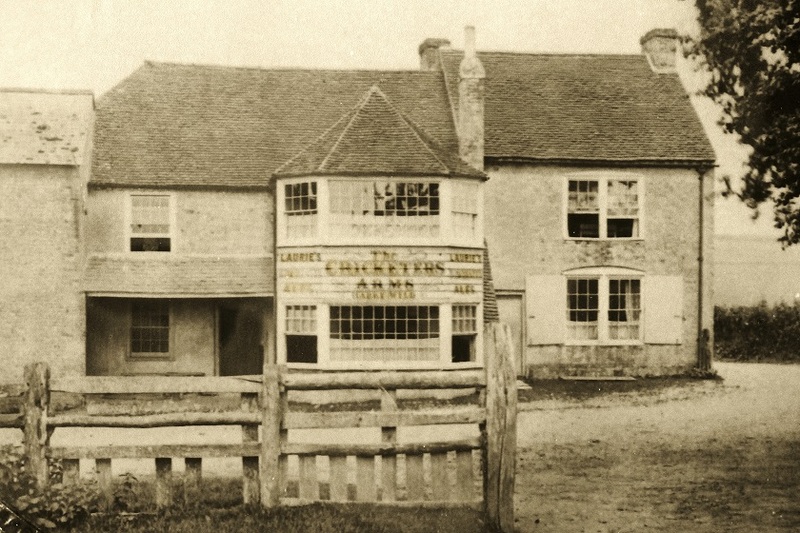 The Cricketer’s Arms takes its name from an earlier pub, in fact the pub that was sited at the other end of Tichborne Down, and indeed possibly stood on the edge of one of the first ever cricket pitches on what is now the golf course. This pub was known as the White Horse, but changed its name to the Cricketer’s Arms when the cricket square was created in front of the windows. This was where the number 5 hole was later sited, and then in 1985 the bypass also cut through this area of the golf course. This old building became a laundry, and was then divided into separate dwelling houses. In 1975, when the book “A Taste of Alresford” was written, Mike Burchett, landlord at the new “Cricketer’s”, was in fact a well-known local cricketer, having captained Winchester and played for Tichborne and the famous Hampshire Hogs. At this time, the pub had an “Off-Sales” entrance at the corner of the building, later removed to create a larger dining room. 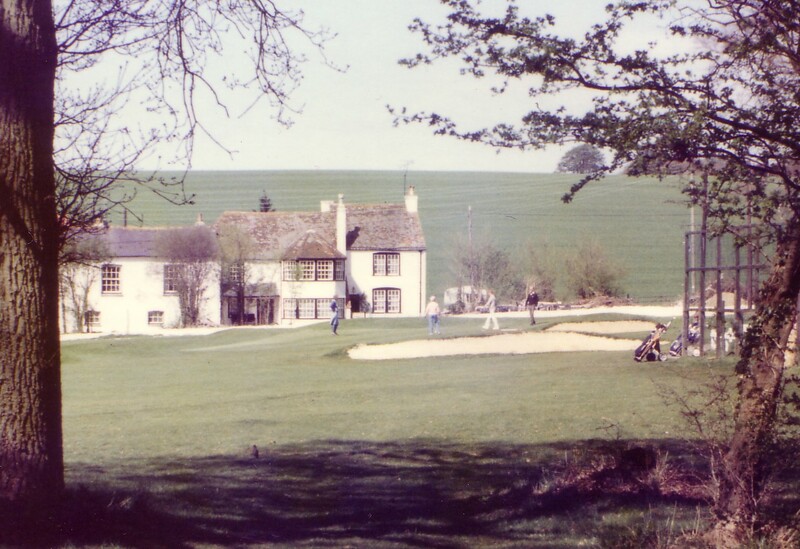 The pub was purpose built in the 1920s, with a clubroom attached for the use of the neighbouring golf club. The first tenant. W. Boniface, was in fact the club’s professional. In the garden are tables, children’s swings and a trampoline: the grounds of the Cricketer’s extend a long way behind the car park, reflecting the large land areas allocated to this and the three other houses built at the time in this area of the town – Shepherd’s Down, Fair View and Paddock Way – the other three have given way to more modern housing. The Golf Club itself was founded in 1890 on land belonging to Sir Joseph Tichborne: the course was grazed by sheep until 1907. Charles Marks of Woking Golf Club was employed as the first professional greenkeeper, but he fell out with Sir Joseph and only stayed two years. The room at the Cricketer’s pub was used as the clubhouse until 1953, when a retired railway carriage was placed by the first tee and used as clubhouse for 16 years. The above information is taken largely from Sally March’s book “A Taste of Alresford” published by Oxfam in 1985. Several of the Boy Scouts in the picture later became members of the Alresford Football Club. 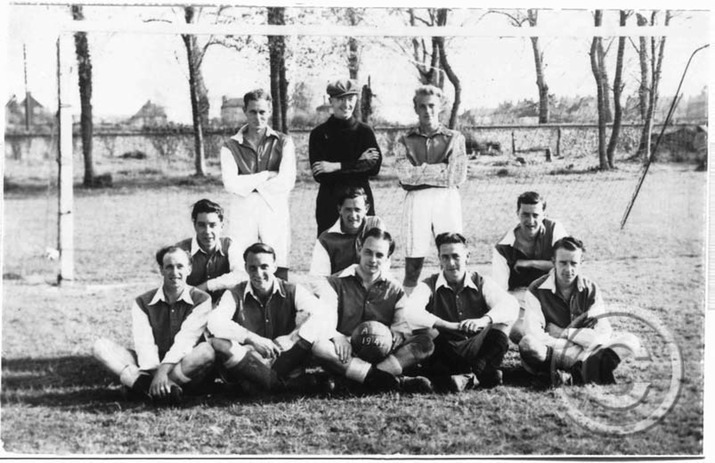 Bill points to a picture which is shown on the Alresford Heritage website, and is borrowed from them here, showing the Football team in 1949. In the back row on the left is Eric Biggs (Bill’s Dad), Eric Lane and Alfred Pearce. Eric Biggs was, like many others, in the local Fire Service during the war. Les Strong, actually the cousin of Len Strong, and currently still living in Alresford, is on the left in the middle row: he was also in the Alresford Fire Brigade for most of his working life. Alongside Les are Alan Trimmear and Douglas Cox. In the front row we have Harry White, Ted Tate, John Hillary, Ronald Clavelly and Ken Nutley. (These team names were provided by the late Mr Harry White). The picture was taken at Alrebury Park, where the car park now stands.